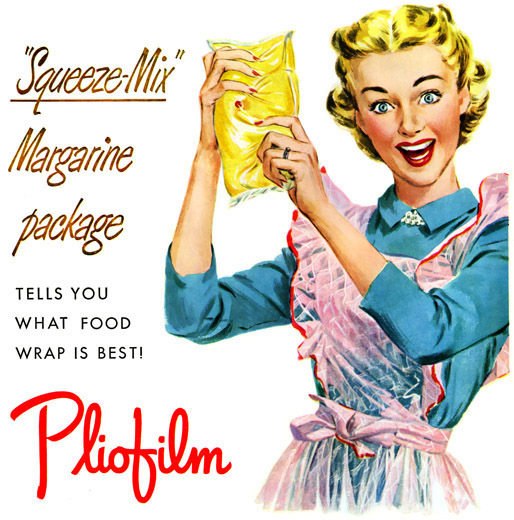 Backstory: In oleo's early days, pressure from the dairy industry led to regulations that forbade the sale of yellow margarine (which is "naturally" white). The manufacturers got around that by including capsules of dye that could be mixed with the margarine in a bowl, and then you'd have to shape the resulting mess into sticks. Later, the dye capsules ("color buds") and oleo were put in plastic packages that you could knead to release and mix the coloring before putting the stuff on your toast, or in your hair.